It was a busy and a bit of a stressful week for me, and the poor plants were totally neglected. My task this weekend is therefore tidying up again, dead-heading and just generally checking up on things. Thanks once again to The Propagator for allowing us to share what is going on in our gardens. First up…it rained yesterday! Not a lot…but here is the proof. Second up, I saw this chocolate mint plant today, and couldn’t resist it – smells exactly like After Eight mints! It will be interesting to see how it grows and to think what I could use it with (mixed through yoghurt to have with roast nectarines perhaps). The purple basil is just bursting with flowers, which I need to trim. You can sprinkle them on salad or make some basil flower vinegar, which is what I am going to do. You just need to place freshly snipped basil flowers into a clean glass jar and cover them with red or white wine vinegar. Leave to infuse for at least a week, then strain out the basil flowers, and put the vinegar into a clean jar. Use it in a dressing with a tomato salad. I was feeling a little droopy this week, a bit like this agapanthus. There are still quite a few around, but it is really approaching the end of the season. 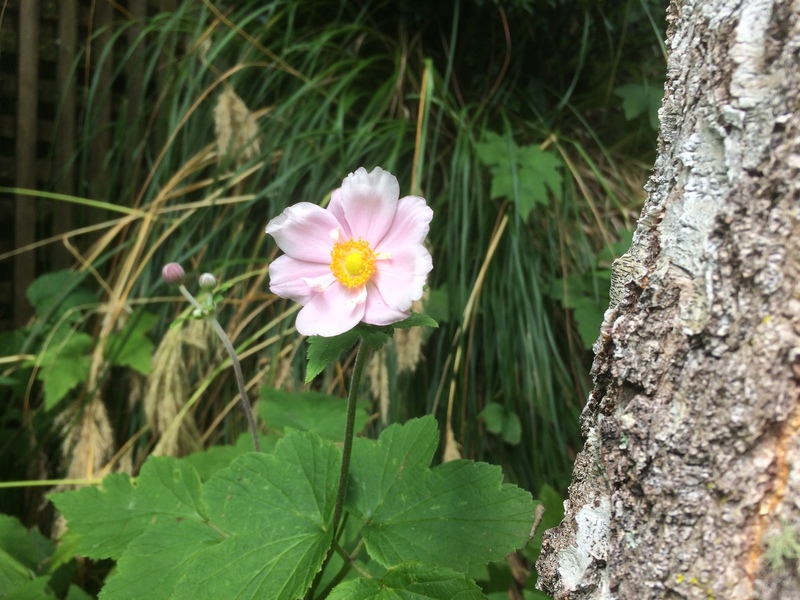 There are Japanese anemone buds all over the place around the side of the house, and indeed, a couple of flowers already. I love these flowers, which seem to like our little patch. So that is me for this week. I look forward to seeing spring gardens in the northern hemisphere. Wow that last photo is fantastic. Is that what rain looks like. It has been a very dry February here. Thanks! So dry here too. I did the old rubbing finger and thumb on a chocolate mint leaf at a herb stall once. It certainly had an After Eight mint scent. I should get one and check out the taste! The basil flowers are lovely. Glad it has rained, always a relief in a dry spell. I hope we have more rain this year, it was a very dry summer by our standards. ..and it is pouring with rain today. Your chocolate mint recipe sounds delicious and the purple basil is flourishing – two great herbs to try. We have at least three giant ferns around the house. Basil – ah yes! The smell of summer. i’ve heard of chocolate mint but never tried it. It smells good at least! You got me at roast nectarines with chocolate mint!